Changes in land use cover can have a crucial impact on the environment in terms of biodiversity and the benefits that ecosystems provide to people. 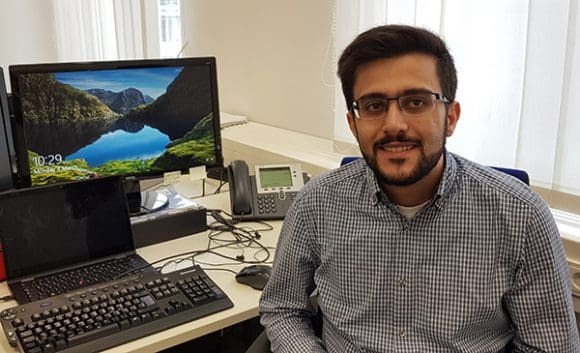 Assessing, quantifying, and identifying where these changes are the most drastic is especially important in countries that have high biodiversity along with high rates of natural vegetation loss. Socioeconomic pressures often drive land use change and the impacts are expected to increase due to population growth and climate change. To better understand the possible impacts of land use change in Mexico over the short, medium, and long term, my colleagues and I used the Shared Socioeconomic Pathways–a set of pathways that span a wide range of feasible future developments in areas such as agriculture, population, and the economy–together with a set of climatic scenarios known as the Representative Concentration Pathways. We focused on Mexico, because the country is large enough to encompass different ecosystems, socioeconomic characteristics, and climates. In addition, Mexico is characterized by high deforestation rates, huge biodiversity, and a large number of communities with contrasting land management practices. Incorporating all these features, allowed us to take the complexity of socioecological systems into account. We designed a model to test how socioeconomic and biophysical drivers, like slope or altitude, may unfold under different scenarios and affect land use. Our model includes 13 categories of which eight represent the most important ecosystems in Mexico (temperate forests, cloud forests, mangroves, scrublands, tropical evergreen and -dry forests, natural grasslands, and other vegetation such as desert ecosystems or natural palms), four represent anthropogenic uses (pasture, rainfed and irrigated agriculture, and human settlements), and one constitutes barren lands. We set two plausible scenarios: “Business as usual” and an optimistic scenario called the “green scenario”. We projected the “business as usual” scenario using medium rates of vegetation loss based on historical trends and combined it with a medium population and economic growth with medium increases in climatic conditions. 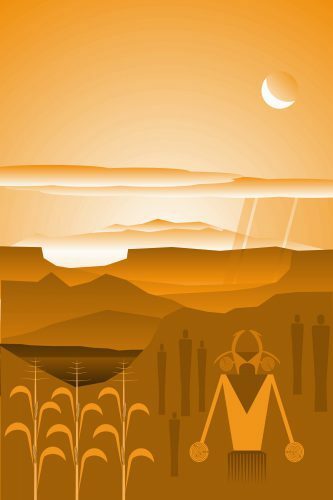 For the “green scenario”, we projected the lowest rates of native vegetation loss and the highest rates of native vegetation recovery with a low population and medium economic growth in a future with low climatic changes. Our results show that natural vegetation will undergo significant reductions in Mexico and that different types of vegetation will be affected differently. Tropical dry and evergreen forests, followed by ‘other’ vegetation and cloud forests are the most vulnerable ecosystems in the country. For example, according to the “business as usual” scenario, tropical dry forests might decrease in extent by 47% by the end of the century. This is extremely important considering that the most recent rates, for the period 2007 to 2011, were even higher than the medium rates we used in this scenario. In contrast, the “green scenario” allowed us to see that, with feasible changes of rate, this ecosystem could increase their distribution. However, even 80 years of regeneration would not be enough to reach the extent these forests had in 1985, when they accounted for around 12% of land cover in Mexico. Moreover, the expansion of anthropogenic land cover (such as agriculture, pastures, and human settlements) might reach 37% of land cover in the country by 2050 and 43% by 2100 under the same scenario. In terms of CO2 emissions due to land use cover change we found that Mexico was responsible for 1-2% of global emissions that are the result of land use cover change, but by 2100 it could account for as much as 5%. Our findings show that conservation policies have not been effective enough to avoid land use cover change, especially in tropical evergreen forests and drier ecosystems such as tropical dry forests, natural grasslands, and other vegetation. Cloud forests have also been badly affected. As a biologically and culturally rich country, Mexico is responsible for maintaining its diversity by implementing a sustainable and intelligent management of its territory. Our study identified hotspots of land use change that can help to prioritize areas for improving environmental performance. Our project is currently linking the hotspots of change with the most threatened and endemic species of Mexican terrestrial vertebrates (mammals, amphibians, reptiles, and birds) to provide useful results that can help prioritize ecosystems, species, or municipalities in Mexico. Figure 1. Agricultural Systems. Comparison of global and regional scale agricultural monitoring systems in terms of number of sources of input data used. Figure 2. 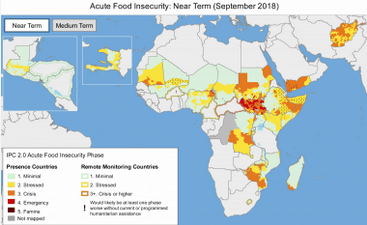 An image from the USAID Famine Early Warning Systems Network (FEWS NET) shows areas of acute near-term food insecurity. Such systems are crucial to monitoring and responding to potential food crises, but gaps remain, particularly for certain crops. As growers, we know soil is important. It supports plants, and provides nutrients and water for them to grow. But do we all appreciate how crucial the role of soil is in continuously supplying plants with water, even when it hasn’t rained for a few days or even weeks, even without extra water being added via watering? Soil is like a sponge. It can retain rain water and, if it is not taken up by plants, soil can store it for a long time. We can feel the water in soil as soil moisture. Try it — take and hold a lump (clod) of soil — if it is wet it will leave a spot on your palm. If it’s only moist then it will feel cold — cooler than the air around. And if the soil is dry, it will feel a little warm. Soil moisture not only can be felt, but it can also be measured — in the lab, or directly in the field with professional or low-cost soil moisture sensors. Soil moisture in general indicates how much water is contained by the soil. But it is not always the case that soil which feels moist or wet is able to support plants. It could happen that, despite feeling moist, the soil simply does not hold enough water, or holds the water too tightly for the plants to extract it. Or the opposite, soil can sometimes contain too much water. To understand how this works, one has to learn more about how water is stored in the soil. Water is bound to soil by physical forces. Some forces are too weak to hold water in the plant root zone and water percolates to deeper layers, where plants can no longer reach it. Other forces can be too strong, preventing water from being retrieved by the roots. If soil moisture is measured at one place over time, it can reveal its seasonal dynamics. Having estimated important soil water content thresholds (FS — full saturation, FC — field capacity, PDA — point of decreased availability, and WP — wilting point) for that particular site, e.g. based on soil texture test or measurement, one can easily interpret if the measured soil moisture and say if there was enough water or not to fully support plants with water and air. In this particular case of sandy 0–30 cm deep topsoil from Slovakia, it was never wet enough to cause oxygen stress for plants, — in fact it never reached state of all capillary voids filled with water (FC). On the other hand, each summer the topsoil moisture dropped below the point of decreased availability (PDA), even got close to the wilting point or went through (WP), which means that during those periods plants suffered drought conditions. In order to describe this behavior in more useful terms, plant ecologists and soil hydrologists came up with couple of important soil water content thresholds (Figure 1). These thresholds, also called “soil moisture ecological intervals”, define how easily plants can get the water out of the soil. We speak about full saturation of soil when all empty spaces (pores/voids) are completely filled with water. Full saturation of the soil with water prevents air entering into the soil. Yet there is no force holding water in the soil. Roots need air as well as water so, if this situation continues, it eventually causes oxygen stress for most of the common plants because roots simply cannot breathe. Soil also has different types of pores. Larger ones, which are called “gravitational pores”, are filled with water only when the soil is saturated and otherwise drains freely, and smaller ones called “capillary pores” which are small enough in size to prevent water from percolating down the soil profile by gravitation. These smaller pores can hold water even in well-drained soils and make it available for plants to extract. There are also even smaller pores where the water is held so tightly that plants cannot extract it. 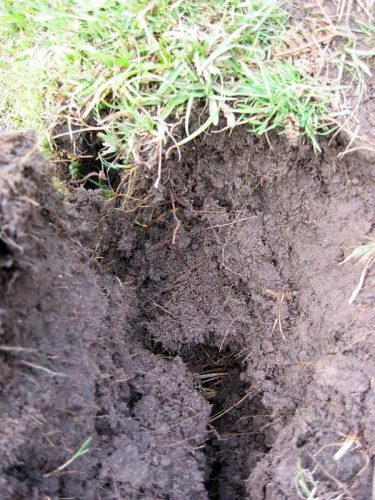 When all gravitational pores/voids are empty of water and it is present only in so called capillary pores/void we speak about the field water capacity — which is considered to be the best soil moisture status of the soil — enabling plants to retrieve the water they need, whilst leaving enough air for roots to breathe. If no new water is added into the soil, the soil dries as water is used by plants or evaporates. As soil dries less water is available to plants until the point of decreased availability when water remains only in the smallest capillary pores/voids. But this water is bound to soil particles so strongly that most plants are not able to extract it suffer from drought. Ultimately, all the available water is used up by plants, and the remaining water is inaccessible. Soil reaches the so-called wilting point and water is not available for the plants anymore. Plants permanently wilt and eventually die. The tricky thing with soil moisture however is that the same amount of water (volumetric percent of the total soil column volume) can, in different soils, represent different amount of water available for plants. How big this difference could be is defined by many soil characteristics. The most important is the soil texture — a blend of all fine-earth soil mineral constituents (sand, silt, clay) and stones in various rates. In general, the finer the texture is (i.e. more clay, less sand) the more water is bound in the soil too tightly to be retrieved by plants. Even if the soil feels moist, plants can permanently wilt in clay soils. In contrast, those soils with coarse texture (i.e. more sand, less clay) can support plants with nearly all the water they can hold. Although the soil looks dry, plants can still effectively take the water out of it. The drawback here is that in coarse textured, sandy, soil nearly all water drains down the gravitational pores and therefore such a soil cannot support plants for very long time. That is also why medium textured soils (loam, silty loam, clay loam) are considered best for holding and providing the water for plants. 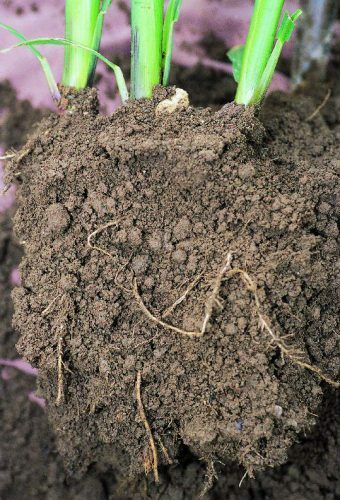 Medium textured soils can effectively drain excess water, yet hold much water in capillary pores/voids for a long time, and still, only a relatively small amount of water remains unavailable for the plants. A practical implication of this behavior of soil with different soil texture could be that one has to apply slightly different strategies to maintain soil moisture in the way that it can effectively supply plants with water. Sandy soils will require more frequent watering with smaller amount of water. It would not make any practical sense to try build-up a storage of water in these soils. All extra water added will simply drain out of the topsoil. Clay rich soils can absorb big amounts of water but a lot is bounded too strongly to the soil particles and thus not available for the plants. Therefore one should water even if the soil looks moist or wet — and if dry a lot of water must be added to recharge the topsoil so that it can support plants effectively. With loamy soils it is possible to be more relaxed with watering frequency, simply because one can build solid storage of water in such soils. 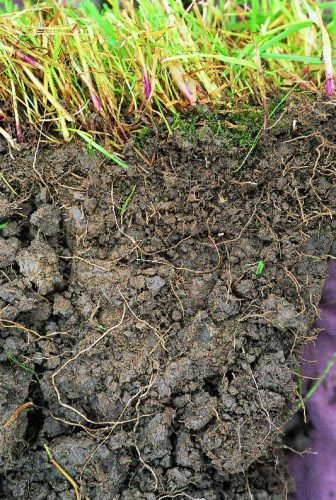 Adding a bit more water than is necessary is perfectly fine with these soils because the water is effectively kept in the soil profile and it can be used later on. Interested in learning more? Why not sign up for GROW Observatory’s next free online course – Citizen Research: From Data to Action – to discover how citizen-generated data on soils, food and a changing climate can create positive change in the world. Starts 5th November.